Widespread support for policies to rebuild American manufacturing is premised on the understanding that “manufacturing matters.” A recent McKinsey Global Institute report explains that one reason manufacturing matters is that manufacturing jobs have “historically offered opportunities for workers without college degrees to gain technical skills and climb the economic ladder,” and therefore manufacturing’s erosion has had “profound effects on the U.S. economy—and on the prospects of American workers in general” (Ramaswamy et al. 2017, 29). These reports raise the question of whether there is a pay premium for manufacturing work and whether this pay premium has eroded, especially recently and for particular types of workers. We review these studies and conduct new analysis of manufacturing wage and benefit premiums and conclude that although the increase in outsourcing manufacturing work to staffing agencies has helped erode pay and job quality, there is still a substantial manufacturing pay premium. Manufacturing workers earn 13.0 percent more in hourly compensation (wages and benefits) than comparable workers earn in the rest of the private sector. The manufacturing compensation premium has declined by about one-fourth (3.9 percentage points) since the 1980s when it was 16.9 percent. Though the manufacturing wage premium has declined, the benefits portion of that premium has not fallen. Manufacturing workers have an advantage in benefits, primarily in insurance and retirement benefits, and this advantage grew between 1986 and 2017. This means that the erosion of the manufacturing wage premium has been partially offset by an improved benefits picture for manufacturing workers. The wage advantage of workers directly employed in manufacturing has fallen from 14.7 percent in the 1980s to 10.4 percent in the 2010s, which represents a significant decline (of 4.3 percentage points or roughly about 30 percent) but still constitutes a substantial manufacturing wage premium. 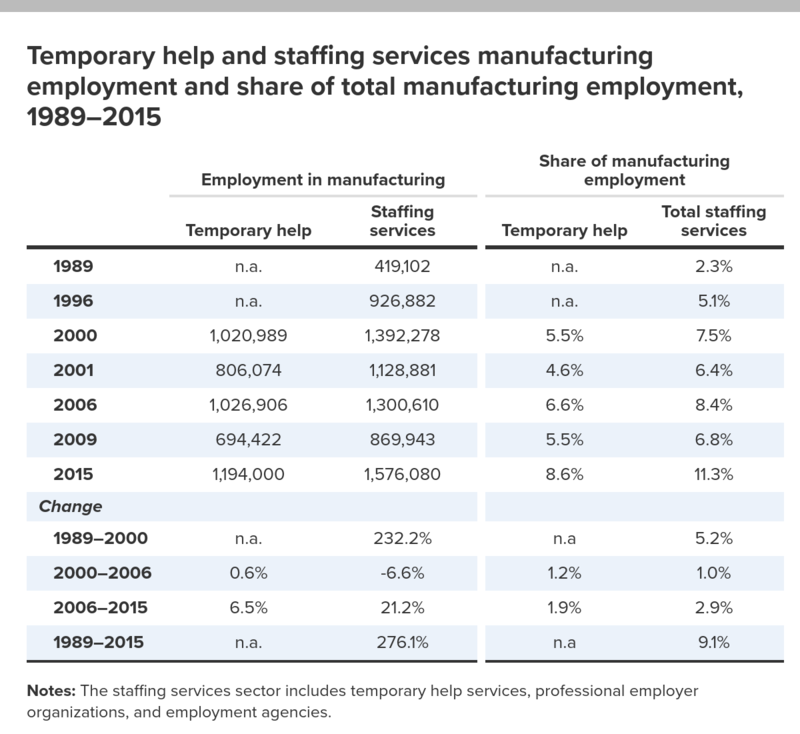 Staffing and temporary help services provided 11.3 percent of all manufacturing employment in 2015, up from just 2.3 percent in 1989. The increased use of workers through staff intermediaries lowered the manufacturing compensation premium by 4.0 percent. This evidence refutes the Congressional Research Service’s 2017 claim that the manufacturing compensation premium had disappeared and confirms the 2012 Commerce Department’s conclusion that the manufacturing compensation premium persists. One benefit of expanding manufacturing employment is that the workers are paid a premium. However, there is less of a pay advantage in manufacturing than there used to be. This suggests that policies to expand manufacturing employment should be accompanied by policies that maintain or strengthen compensation standards. This paper begins with a review of several recent studies on manufacturing pay and the quality of manufacturing jobs. The second section presents new estimates of the scale and trend of the manufacturing wage premium and augments this with an analysis of fringe benefits in manufacturing relative to other sectors to produce estimates of the manufacturing compensation premium. The third section examines the trend in temporary and staffing agency employment and assesses its impact on overall manufacturing job quality and the wage and benefit premium. Making It in America: Revitalizing US Manufacturing, a recent report from the McKinsey Global Institute, restates one common answer to the question of whether “manufacturing matters.” According to the report, manufacturing jobs have “historically offered opportunities for workers without college degrees to gain technical skills and climb the economic ladder” (Ramaswamy et al. 2017, 29). Consequently, manufacturing’s erosion has had “profound effects on the U.S. economy—and on the prospects of American workers in general,” the authors assert. The “compensation premium” the authors refer to is the greater wages and benefits that manufacturing workers earn relative to comparably skilled workers in other sectors. This compensation premium is one of the reasons why manufacturing jobs are described as high quality jobs. The oft-made claim that manufacturing jobs pay a premium has recently been challenged. Before examining that challenge it is worth reviewing The Benefits of Manufacturing Jobs and a later Commerce Department report that both present detailed empirical work on this issue. The Commerce Department issued two studies on the manufacturing pay premium in recent years. The Benefits of Manufacturing Jobs (Langdon and Lehrman 2012) looks at changes in the premium over time and finds that even after controlling for demographic, geographic, and job characteristics, manufacturing jobs maintain significant wage and benefit premiums. It also finds that the compensation premium has risen over the past decade across all levels of educational attainment. The analysis relies on “regression analyses investigating the extent to which log hourly earnings were explained by factors including age, marital status, race, ethnicity, region, metropolitan area status, union status, and occupation. After controlling for the impacts of this set of characteristics, the manufacturing wage premium in 2011 was estimated to be 7 percent” (Langdon and Lehrman 2012, 6).1 The sample was for private-sector wage and salary workers who were 25 years old and older and had any earnings over the year. The results for 2011 are presented in the first data column of Table 1. Notes: The manufacturing premium (wage and compensation) is for workers age 25 and older and shows how much more a manufacturing worker makes per hour than a comparable nonmanufacturing worker in the private sector. It is notable that the authors find a slight decline in the overall manufacturing wage premium from 2000 to 2011, and a lower and more rapidly declining premium for those with a high school diploma or less (a group constituting about 55 percent of all manufacturing workers in 2000 but just 45 percent by 2011). 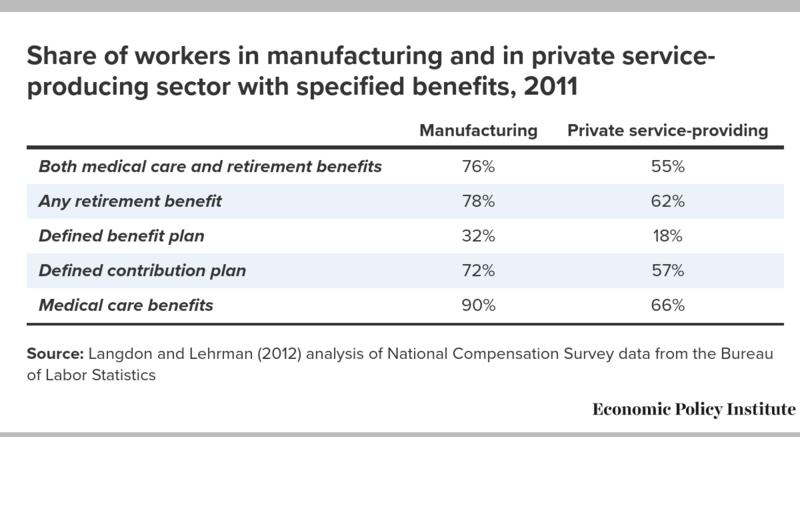 The Commerce Department 2012 study, however, highlights that manufacturing workers receive far better benefits—health care and retirement—than do private-sector workers in the private service-providing sector. Taking benefits into account sharply raises the estimated manufacturing pay premium, as shown in the second column of Table 1.2 Before discussing the total compensation premiums presented in Table 1, we turn to Table 2, which provides their findings that manufacturing workers are far more likely to have both employer-provided health and retirement benefits (76 percent) than do workers in the private service-providing sector (55 percent) and more likely to have a defined benefit (32 percent versus 18 percent) or a defined contribution retirement plan (72 percent versus 57 percent). The authors use data from the Commerce Department’s National Income and Product Accounts (NIPAs) to calculate the ratio of total compensation to wage and salary accruals in each industry and correspondingly modify the wage data in their regression analysis to estimate the manufacturing compensation (wage and benefit) premium. As shown in Table 1, they find that the total compensation premium was twice as high (15 percent) in 2011 as their estimated wage premium (7 percent). The compensation premium was 12 percent in 2000. The total compensation premium for manufacturing workers with a high school diploma or less was 11 percent, far higher than the wage premium for this group of just 3 percent. These results underscore the importance of analyzing total compensation, including benefits, when assessing the manufacturing pay premium’s level and trend. The 2015 Commerce Department study makes an important point about differences in work time in manufacturing relative to other sectors: “The average manufacturing employee works more hours per week and more weeks per year than the average private-sector employee, so the longer hours worked amplifies the hourly pay premium when pay is measured over weeks, months, quarters, and years.” Consequently, “when hours worked in a week or over the course of a year are taken into consideration, the estimated premium increases” (Nicholson and Powers 2015, 7, 2). The longer work hours and greater number of work weeks per year means that both the estimated hourly manufacturing pay premium discussed in the first Commerce Department study (Langdon and Lehrman 2012) and what we present below understate the manufacturing pay premium because the estimates do not account for the greater working time of manufacturing workers over the course of a year. In 2017, Marc Levinson of the Congressional Research Service wrote a report called Job Creation in the Manufacturing Revival. As noted earlier, this report asserts, “Although workers in some manufacturing industries earn relatively high wages, the assertion that manufacturing as a whole provides better jobs than the rest of the economy is increasingly difficult to defend” (Levinson 2017, 9). This 2017 report is worth reviewing as its claims were picked up by other researchers casting doubt on the existence of the manufacturing pay premium. For example, McKinsey Global Institute’s 2017 report Making It in America: Revitalizing US Manufacturing, cited Levinson’s report for CRS as the source for concluding that “the wage premium traditionally associated with manufacturing has evaporated when the comparison considers the degree to which sectors employ teenagers, employ part-time workers, and require similar levels of worker education” (Ramaswamy et al. 2017, 2). This section assesses the empirical evidence in the CRS report, including its critique of Langdon and Lehrman’s 2012 Commerce Department study discussed above. We find that the CRS report offers very little empirical evidence to support its strong conclusion that the manufacturing pay premium has disappeared. The discussion here will focus on the report’s three main claims about wage levels, wage trends, and benefits of manufacturing workers relative to other workers. Regarding the first two quotes presented here, simply noting that some industries such as utilities and construction pay more than manufacturing does not disprove that manufacturing is a relatively large sector that does provide relatively higher wages and benefits than similar workers earn elsewhere in the private sector. The third quote also represents an unsubstantiated claim. The claim is that manufacturing wages and benefits exceed that of other industries primarily because it has fewer young workers and fewer workers working part time (who are less likely to receive benefits and are paid less). The report offers no specific quantitative assessment of the impact of these age and part-time characteristics on relative wages and benefits: the only data offered are that some low-wage industries are more likely to hire teenagers and part-time workers (Levinson 2017, 7). This is hardly persuasive. Langdon and Lehrman’s 2012 study for the Commerce Department uses a regression analysis that addresses these concerns by directly controlling for age and for full-time status and, as discussed above, finds a 7 percent wage premium and a 15 percent compensation premium. In his study for CRS, Levinson was well aware of Langdon and Lehrman’s finding because he critiques their study. The CRS report also argues that “average manufacturing wages have declined over time, compared to those in other industries, with the exceptions of retailing and transportation” (Levinson 2017, 8). It is true that manufacturing wages have not fared as well as wages in some other industries. But this hardly justifies the claim that the manufacturing wage premium has disappeared (a claim made by Levinson [2017, 9] when he writes, “the assertion that manufacturing as a whole provides better jobs than the rest of the economy is increasingly difficult to defend.” The CRS report does provide some data showing that wages of nonsupervisory workers in other industries have become closer to wages of nonsupervisory workers in manufacturing.3 Such findings, however, do not account for the composition of jobs by skill and education level or for changes in the demographic characteristics, education levels, or other characteristics of workers in each sector, or the size of each sector. The Commerce Department’s regression analyses of wage data (and especially compensation data) over the 2000–2011 period are certainly more persuasive (Langdon and Lehrman 2012). In other words, the data that Levinson (2017) relies on to compare manufacturing wages with those of industries in other sectors are making apples and oranges comparisons. Again, there is no quantitative evidence offered to support any claim that there is no longer a manufacturing advantage in employee benefits. In fact, there is no evidence offered at all! The footnote supposedly supplying the source for this conclusion is simply a reference to the website for the Bureau of Labor Statistics (BLS) National Compensation Survey (the footnote says, “For data, see http://www.bls.gov/ncs”). That is, no analyses of any data are actually presented and the analysis is left for the readers to do for themselves. The data presented in the Commerce Department report (Langdon and Lehrman 2012) on the relative greater availability of retirement and health benefits in manufacturing and the greater dollar value of benefits in manufacturing is a powerful rebuttal of this CRS claim. In the section of our report titled “New estimates of the manufacturing wage and compensation premiums,” we confirm Langdon and Lehrman’s 2012 analysis using BLS data for 1986 to 2016 that shows a substantial benefits premium for manufacturing workers. As noted above, a claim that manufacturing has fewer young workers and fewer part-time workers does not prove that manufacturing provides no pay premium. What is missing from the CRS analysis is any quantification that shows that age and part-time work patterns explain the manufacturing premium. And, as noted above, the Commerce Department study provides contrary evidence since its regression analyses control for workers’ age and full-time status and still find a substantial wage and compensation premium. As the study argues, “in order to quantify the extent to which a wage premium really exists in manufacturing, it is important to consider the extent to which factors such as educational attainment, location, and job characteristics of workers affect wages” (Langdon and Lehrman 2012, 5). There is also an unstated and erroneous assumption in the CRS analysis that the pay penalty suffered by part-time workers—receiving less in wages and benefits per hour worked—reflects less productivity for those workers. In fact, the part-time pay penalty is a form of discrimination (Golden forthcoming 2018) and reflects the weaker bargaining position of part-time workers. In this light, the fact that manufacturing employs fewer part-time workers and/or has a lesser pay penalty for part-time work is another advantage of manufacturing work. 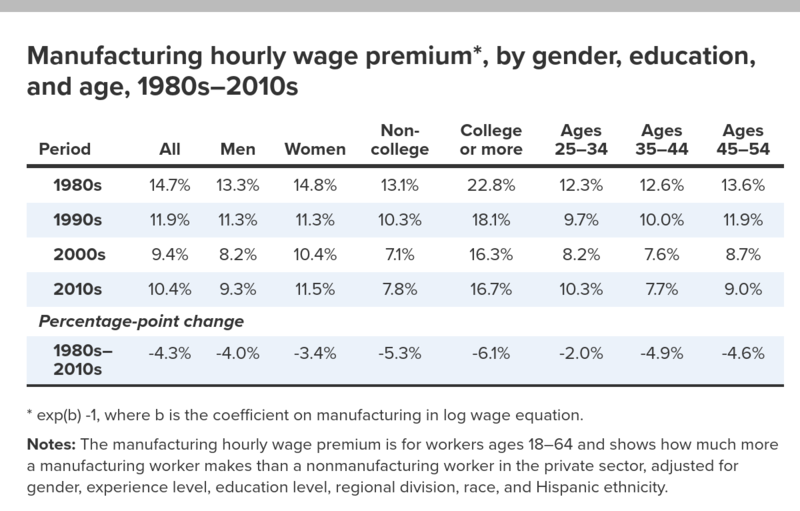 This section begins by examining the level and trend of the manufacturing hourly wage premium from the 1980s through the 2010s (up through 2016). This analysis, which uses data from the Current Population Survey (CPS) compiled by the BLS, is comparable to that presented in the Commerce Department study (Langdon and Lehrman 2012) discussed above though it extends further back in time and updates the analysis through 2016. Our main results are presented in Table 3, which shows the estimated wage premium by decade5 for the whole sample and for separate samples of men, women, non-college-educated and college-educated workers.6 Non-college-educated workers include those without a high school diploma, with a high school diploma only, with an associate degree, and some college experience but no bachelor’s degree. In the 2010–2016 period the manufacturing wage premium overall was 10.4 percent, 9.3 percent among men and 11.5 percent among women. The manufacturing wage premiums in the 2010s are generally slightly above those in the 2000s and substantially below those in the 1980s. For instance, the overall manufacturing wage premium fell from 14.7 percent in the 1980s to 10.4 percent in the 2010s, a 4.3 percentage-point decline (a drop of roughly 30 percent). This provides evidence that there remains a manufacturing wage premium but that it has substantially fallen since the 1980s. * exp(b) -1, where b is the coefficient on manufacturing in log wage equation. Notes: The manufacturing hourly wage premium is for workers ages 18–64 and shows how much more a manufacturing worker makes than a nonmanufacturing worker in the private sector, adjusted for gender, experience level, education level, regional division, race, and Hispanic ethnicity. These results confirm the Commerce Department study’s finding that the manufacturing wage premium is larger among college-educated workers than among non-college-educated workers (Langdon and Lehrman 2012). Table 3 shows that college-educated workers (those with at least a bachelor’s degree) have a manufacturing wage premium of 16.7 percent, compared with 7.8 percent for non-college-educated workers. The manufacturing wage premium does not differ as much across age groups and in the most recent years appears to be somewhat larger for the younger workers (it is 10.3 percent for workers ages 25–34) than for older workers (9.0 percent for workers ages 45–54). The manufacturing wage premium fell the most from the 1980s to the 2010s among workers ages 35–44 and ages 45–54, including a 4.9 percentage-point reduction (a 39 percent decline) among those ages 35–44. A new analysis of wage, benefit, and compensation trends in manufacturing and in the private sector augment our analysis of the manufacturing wage premium. This wage, benefit, and compensation trend analysis contradicts the Congressional Research Service’s claim that benefits in manufacturing have fallen relative to other sectors (Levinson 2017). In fact, this analysis indicates that manufacturing benefits are larger and grew somewhat faster than those in the overall private sector, both in inflation-adjusted dollar terms and also as a share of total compensation. This means that the manufacturing compensation premium is greater than the manufacturing wage premium and that the erosion of the manufacturing wage premium has been partially offset by an improved benefits picture for manufacturing workers. It may be the case, in fact, that manufacturing workers have traded off wages to maintain or improve the value of their benefit packages. There are no surveys of workers that have data on wages and the value of benefits enabling a regression-based estimate of the manufacturing compensation premium comparable to that of the manufacturing wage premium presented in Table 3. The Commerce Department (Langdon and Lehrman 2012) addressed this by employing information on the ratios of industry average compensation to wages to adjust the wages data from the Current Population Survey and conduct regression analyses with the adjusted data. We take a less comprehensive approach and simply analyze the wage, benefit, and total compensation trends in manufacturing and in the private sector from 1986 to 2017. This permits an assessment of whether our conclusions regarding the manufacturing wage premium are consistent with an expanded analysis incorporating benefit trends. We use data from the BLS Employer Costs for Employee Compensation (ECEC) series, a product of the National Compensation Survey that includes detailed information on benefits, wages, and total compensation for various sectors and occupations back to 1986. We examine the levels and trends for manufacturing and compare them with those of the entire private sector. Because our purpose is to augment analyses of wage trends it is necessary to aggregate the categories of compensation differently than BLS. Specifically, the BLS definition of “benefits” includes items that are included in weekly paychecks and W-2 wages and, most importantly, are captured in the measure of wages used in the Current Population Survey.7 We add the value of “paid leave” and “supplemental pay” to the BLS measure of wages to obtain our measure of W-2 wages. Benefits therefore are the remainder of compensation and include the costs of insurance (mostly health insurance) and retirement plans (defined benefit and defined contribution) and legally required costs, otherwise known as payroll taxes (for Social Security, Medicare, unemployment insurance, and workers’ compensation). 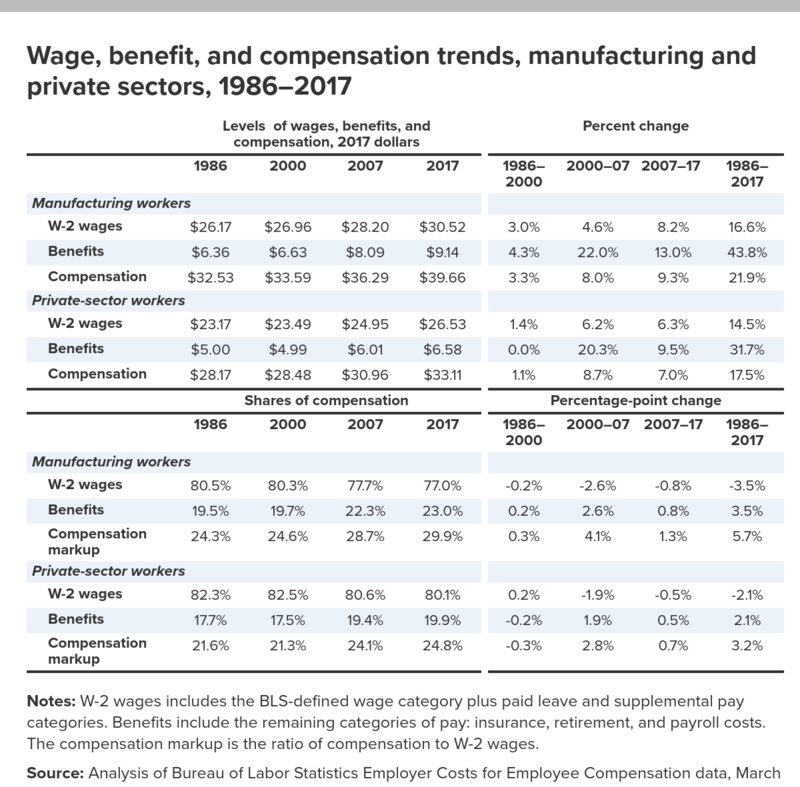 Table 4 provides the inflation-adjusted levels and growth of wages, benefits, and total compensation and the share of wages and benefits in total compensation for manufacturing and private-sector workers in 1986, 2000, 2007, and 2017.8 Over the entire 1986–2017 period W-2 wages, benefits, and total compensation grew faster in manufacturing than for the private sector. This was true for every sub-period, except the 2000–2007 period when wages and total compensation grew somewhat faster in the private than manufacturing sector. Notes: W-2 wages includes the BLS-defined wage category plus paid leave and supplemental pay categories. Benefits include the remaining categories of pay: insurance, retirement, and payroll costs. The compensation markup is the ratio of compensation to W-2 wages. Benefits play a larger role in manufacturing than in private-sector compensation, constituting 23.0 percent of total compensation in 2017 whereas in the private sector benefits constitute 19.9 percent of the compensation package. Benefits became more important in both sectors between 1986 and 2017 rising as a share of total compensation by 3.5 percentage points in manufacturing and by 2.1 percentage points in the private sector. This directly contradicts two of the claims that were made in the CRS study (Levinson 2017) by showing that there is no evidence that (1) the manufacturing premium in benefits has disappeared; and that (2) the manufacturing premium in benefits has eroded in the 2000s or even over the period since 1986. A complete analysis of wage, benefit, and compensation trends would be able to adjust for changes in each sector for location shifts, for differences in worker education and age characteristics, and so on. That is not possible with the ECEC data. However, we can use the wage, benefit, and compensation data in Table 4 to adjust the estimated manufacturing wage premium from Table 3 to estimate a trend in the manufacturing compensation premium.9 This allows us to gauge the scale and direction of benefit changes and how they impact the manufacturing pay premium, as shown in Table 5. Notes: The manufacturing wage and compensations premiums are for workers age 18–64 and show how much more a manufacturing worker earns in hourly wages, and in hourly wages and benefits, than comparable nonmanufacturing workers in the private sector. 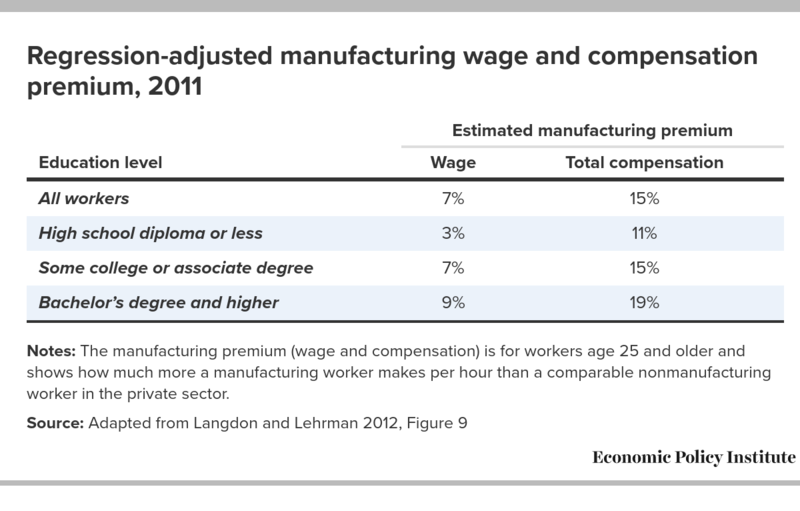 Source: The manufacturing wage premium is from Table 3. The manufacturing compensation premium adjusts wages according to the compensation markup in Table 4. The adjusted manufacturing premium adjusts the manufacturing compensation premium for the rise in staffing service employment in manufacturing using the impact estimated for the household survey (data column 4). The first two data columns in Table 5 indicate that the manufacturing compensation premium (the pay boost for working in manufacturing versus the private nonmanufacturing sector) is higher than the wage premium by a few percentage points with, for instance, the compensation premium being 15.0 percent in the 2010s though the wage premium was 10.4 percent. The results also indicate that the improvement in benefits in manufacturing relative to other workers lessened the overall fall in the manufacturing pay advantage. Though the manufacturing wage premium fell 4.3 percentage points, from 14.7 percent to 10.4 percent, the manufacturing compensation premium fell 2.3 percentage points from 17.3 percent to 15.0 percent. A reasonable interpretation is that there remains a manufacturing wage premium and that it has fallen since the 1980s but that the fall in manufacturing relative wage has been partially offset by an improvement in benefits for manufacturing workers. 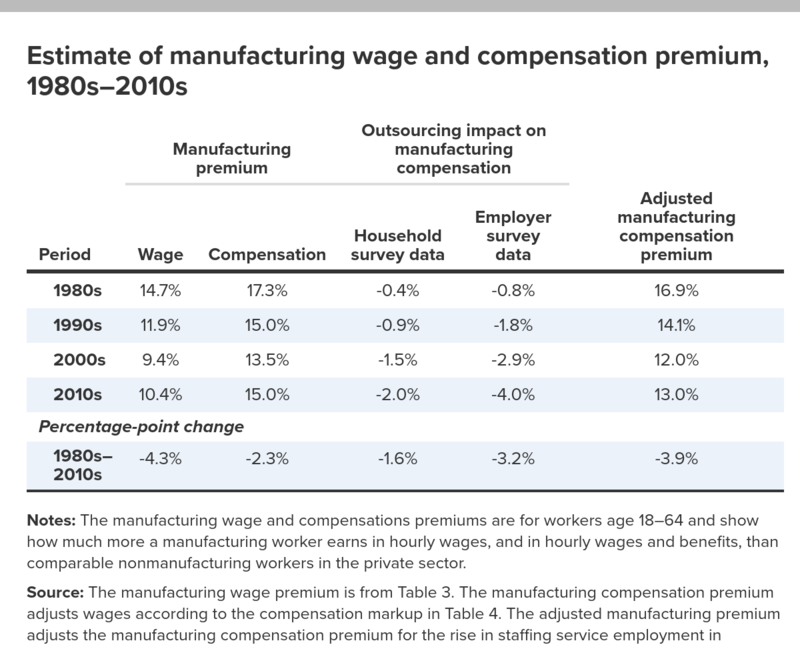 The “adjusted manufacturing premium” in the last column of Table 5 reflects the last step in our analysis—account for the increased use of staffing services to make manufactured goods. The workers provided by staffing firms to manufacturing firms are paid substantially less than workers directly employed by manufacturing firms, but because government statistics (specifically, employer-based surveys of payroll employment) don’t categorize these lower-paid “outsourced” workers as manufacturing workers, government data undercount manufacturing employment and overstate wage and compensation levels in manufacturing. Specifically, in data obtained from BLS’s employer payroll survey (Current Employment Statistics) the employment, wages, and compensation of all workers supplied to manufacturing firms through staffing firms are counted under “Employment services” in the “Administrative and waste services” component of the “Professional and business services” sector. In data obtained from the BLS/U.S. Census Bureau’s household survey (the Current Population Survey) the households taking the survey self-report their sector of employment, and roughly half of those in staffing services assigned to manufacturing report that they work for a staffing firm (with the other half reporting that they work in manufacturing).10 Data columns three and four in Table 5 adjust the manufacturing compensation premium to account for the fact that both household and employer-provided employment data undercount employment in manufacturing, albeit to a different degree. Table 6 provides the analysis behind the adjustments shown in Table 5. We are fortunate that Dey, Houseman, and Polivka (2012, 2017) have estimated the growth of staffing services employment within manufacturing. We employ their analysis to estimate the trends in both temporary help agency employment and total staffing services employment assigned to manufacturing firms and use those trend data along with an estimate of the compensation level of manufacturing staffing service employment to assess the impact of staffing services on the manufacturing compensation premium. Notes: The staffing services sector includes temporary help services, professional employer organizations, and employment agencies. The staffing services sector comprises three industries—(1) temporary help services, (2) professional employer organizations (PEOs), and (3) employment agencies—which accounted for 77%, 15%, and 9%, respectively, of employment in the sector in 2010. The Dey, Houseman, and Polivka research estimates manufacturing employment via temporary help services from 2000 to 2015 (Dey, Houseman, and Polivka 2012, Table 3 and 2017, Table 1) and manufacturing employment via overall staffing services (the aggregate of outsourced employment) from 1989 to 2009 (Dey, Houseman, and Polivka 2012, Table 3). The authors refrain from estimating manufacturing employment via staffing services in 2015 because there appears to be systematic mismeasurement in professional employer organizations in recent years, and the PEOs category is the largest component of staffing services that is not in temporary help agencies.11 We estimate the staffing service employment in 2015 by extrapolating (based on the ratio of staffing services to temporary help agency employment in earlier years) from their 2015 estimate of temporary help manufacturing employment.12 The basic trends are presented in Table 6, which shows the employment levels provided through temporary help and all staff services intermediaries and the corresponding shares of total manufacturing payroll employment.13 Staffing intermediaries provided nearly 1.6 million workers to manufacturing firms in 2015, accounting for 11.3 percent of total manufacturing employment. Staffing service employment grew most rapidly in the 1990s but also grew a healthy 21.2 percent between 2006 and 2015. In contrast, direct hires in manufacturing fell from 18.0 million in 1989 to just 12.3 million in 2015.14 The case study of team assemblers in the text box provides an example of the growth of staffing service outsourcing in manufacturing. “Since 2002, the number of temporary Team Assemblers across all industries has grown from 57,520 (5.0 percent of all team assemblers) in 2002, to 176,590 (16.7 percent) in 2013. Over the same time period, the total number of Team Assemblers, across all industries, shrunk 7.1 percent,” the authors write. According to the report, data from the first two quarters of 2014 “show that auto parts manufacturers used staffing agencies to supply 13.5 to 14.5 percent of their work­force. Assuming that the currently reported 318,020 auto parts production workers only represent 85.5 per­cent of workers on the shop floor, an additional 53,933 staffing agency workers (and 17,623 agency-employed Team Assemblers) are unaccounted for in official indus­try figures. This is significant, because the median wage of Team Assemblers working through staffing agencies is 29 percent lower than Team Assemblers directly hired in the auto parts industry” (Ruckelshaus and Leberstein 2014, 14). How did this influx of workers via staffing agencies affect the compensation of manufacturing workers and, accordingly, the manufacturing compensation premium? This depends on how quickly staffing employment grew (relative to the reported employment in the particular survey) and how much less these workers earn than directly hired manufacturing workers. Table 6 summarizes the employment trends used to estimate the impact of staffing services outsourcing on manufacturing compensation premiums from 1989 to 2015. The other parameter required is how much less staffing workers earn than direct hires in manufacturing. We focus on the relative wages in production occupations (i.e., not administrative or white-collar) because workers in these occupations make up the vast majority of the workers supplied to manufacturing firms. The May 2016 Occupational Employment Survey data (BLS-OES 2016) show that production workers in the staffing services industry earned $13.34, 26.6 percent less an hour than the $18.18 hourly wage of similar workers in manufacturing.15 Using September 2016 data from the Employer Costs for Employee Compensation (BLS-ECEC 2016) to obtain compensation–to–W-2 wage ratios we estimate that production workers in the staffing services industry earned $15.81, 33.1 percent less an hour than the compensation earned by similar workers in manufacturing, $23.64.16 We then compute how the increased share of staffing service workers earning just 65 percent (rounding) of what manufacturing workers earn affected the average level of compensation. The understatement of manufacturing compensation due to the growth of staffing services’ share of manufacturing employment depends on the degree to which the household and employer surveys undercount manufacturing employment by leaving out staffing workers and the compensation differential between directly employed manufacturing workers and those employed by staffing services. The estimated impact of the staffing services undercount on manufacturing compensation is presented in Table 5 as “outsourcing impact on manufacturing compensation” and presented for both the household (CPS) and the employer (CES) survey. The mismeasurement impact in the household survey is half that in the employment survey, presuming (as noted above) that half of staffing services employees self-report working in manufacturing. Using data from the employer payroll survey, the increasing use of staffing services to fill manufacturing jobs lowered manufacturing compensation by just 0.8 percent in the 1980s but the impact grew about a percentage point each decade thereafter until the 2010s, when outsourcing led to a 4.0 percent reduction in compensation. Using employer payroll data, the growth of manufacturing outsourcing reduced overall compensation in manufacturing by 3.2 percent from the 1980s to the 2010s. 17 This analysis of employer payroll data provides our complete estimate of the impact of increased staffing services on manufacturing compensation. The impact is half as large when using household survey data because when using household data half of workers employed in manufacturing through staffing services report that they work in manufacturing. To avoid double counting we use the outsourcing impact in household survey data (Table 5, data column 3) to adjust the manufacturing premium (data column 2) because the primary data basis for that estimate is a set of regressions using household data. This is done by subtracting outsourcing’s impact on compensation in the household survey from the previously discussed manufacturing compensation premium in data column two to obtain our “bottom-line” adjusted manufacturing compensation premium in the final column. We find that manufacturing workers enjoyed a compensation premium of 13.0 percent in the 2010s, a steep 3.9 percentage-point drop from the adjusted manufacturing compensation premium of 16.9 percent in the 1980s. That is, the manufacturing compensation premium remains but it has fallen by roughly a quarter between the 1980s and recent years. This paper examines the levels and trends of the wage and compensation premiums earned by manufacturing workers—a pay “bonus” workers enjoy if they work in manufacturing relative to comparable private-sector workers who do not work in manufacturing. Contrary to some claims, there is a sizable manufacturing compensation premium of 13.0 percent in the 2010s. To understand the scale of the manufacturing pay premium it is important to consider both wages and benefits because the manufacturing advantage in benefits is substantially greater than for wages. At the same time, there has been severe pressure on manufacturing firms to reduce pay and they have done so by reducing wages and by using staffing services firms as intermediaries. The result is that the compensation premium in manufacturing is substantially lower in recent years than it was in the 1980s. This suggests that those who advocate policies to expand manufacturing cannot take the pay premium for granted. Rather, they should create and promote policies to support compensation levels and the overall quality of jobs in manufacturing. The author thanks Susan Houseman, Robert Scott, and Josh Bivens for comments and Julia Wolfe for research assistance. 2. Langdon and Lehrman make the comparison to private service-providing sectors as a proxy for nonmanufacturing sectors; nonmanufacturing would include some goods-producing sectors such as construction and mining. There is no comparison possible for nonmanufacturing workers or for all public- and private service-providing sectors. 3. This is similar to the data provided by two prominent journalists who wrote articles saying that the manufacturing wage premium has disappeared (Fox 2015; Tankersley 2013). 4. The Commerce Department (Langdon and Lehrman 2012) analysis, however, has more controls, including occupation, major industry sector, unionization, full-time status, and marital status. The location controls in the Commerce Department study include regions (4) and metropolitan status whereas our analysis controls for presence in one of the nine geographic divisions. 5. Premiums by decade average all years in that decade. 6. For the education subgroups we still retain education controls. For non-college-educated workers there are controls for less than high school and some college with high school graduates being the omitted category. For college graduates there is a control for having an advanced degree with the omitted category being a terminal college degree. 7. These items are also included in the wages measured in the oft-used employer-based survey that produces the wage series for nonsupervisory workers (the BLS Current Employment Statistics (CES) program, also known as the payroll survey). 8. It is not possible to compare manufacturing workers with private nonmanufacturing workers. So the choice is to compare manufacturing workers with private service-providing sectors, as the Commerce Department study (Langdon and Lehrman 2012) did or to compare, as we have chosen, manufacturing workers with all private-sector workers. 9. Start with the estimated manufacturing wage premium in Table 3 and set that as 100 plus the premium for manufacturing for each time period. So, for the 1980s, manufacturing equals 114.7. That means the nonmanufacturing value is 100.0. We then apply the compensation markup data (the percent by which compensation exceeds wages) in Table 4 to obtain a value of compensation in each sector. For the 1980s, for instance, we multiply one plus 24.3 percent times 114.7 to obtain the manufacturing value for total compensation of 142.6 (1.243*114.7=142.6) . The corresponding value for nonmanufacturing is 121.6. We can then compute that manufacturing compensation is 17.3 percent greater than that of nonmanufacturing. 10. This is based on tabulations of the Contingent Worker supplement to the CPS. According to the tabulations, half of the respondents working in staffing services report working in manufacturing. There is no indication of a trend over time, so the bias remains constant. This is based on small samples and should be treated accordingly. Source: Author’s personal communication with Susan Houseman, February 2018. 11. It seems that state employment agencies have gradually been assigning employment in PEOs to the sectors where people work. Source: Author’s personal communication with Susan Houseman, February 2018. 12. We need to estimate staffing services assignment of workers to manufacturing. We start with the Dey, Houseman, and Polivka (2017) estimate of the temporary help manufacturing employment. Temporary help agency employment accounted for about 77 percent of all staffing agency employment in 2010. Dey, Houseman, and Polivka (2012) provide estimates of both temporary help and staffing agency manufacturing employment in four years: 2000, 2001, 2006, and 2009. The average ratio of staffing agency to temporary help manufacturing employment in those years is 1.321, which we use to inflate temporary help (1,194,000) to staffing agency manufacturing employment (1,576,000) in 2015. This adds slightly less than 400,000 to overall manufacturing employment. 13. The computation of shares of temporary help manufacturing employment in total manufacturing employment identifies total manufacturing employment as the sum of employment directly hired by manufacturing firms and the manufacturing employment provided by temporary help agencies. Similarly, the shares for staffing agencies adds the staffing manufacturing employment to manufacturing direct hires to obtain total manufacturing employment. 14. Using CES data on manufacturing, CES3000000001. 15. Production Occupations (SOC Code510000) in Employment Services (561300) and Manufacturing (Sectors 31–34). 16. To convert wages to compensation we rely on the Employer Costs for Employee Compensation release for September 2016 (BLS-ECEC 2016), Table 10. There are data for manufacturing workers and for Administrative and Waste Services, which includes employment services (i.e., staffing services). As we did for the analysis in Table 4 we include “paid leave” and “supplemental pay” in a measure of W-2 wages. The ratio of compensation to W-2 wages is multiplied by the corresponding wage to obtain compensation. The compensation ratio was 1.300 and 1.185, respectively, in manufacturing and Administrative and Waste Services. Bureau of Labor Statistics, Current Employment Statistics (BLS-CES). Various years. https://www.bls.gov/ces/home.htm. Bureau of Labor Statistics, Employer Costs for Employee Compensation (BLS-ECEC). 2016. “Employer Costs for Employee Compensation—September 2016.” USDL-16-2255 (news release), December 8. Bureau of Labor Statistics, Occupational Employment Statistics (BLS-OES). 2016. May 2016 National Occupational Employment and Wage Estimates. Bureau of Labor Statistics and U.S. Census Bureau. Current Population Survey. Various years. https://www.bls.gov/cps/home.htm. Dey, Matthew, Susan Houseman, Anne Polivka. 2012. “Manufacturers’ Outsourcing to Staffing Services.” Industrial and Labor Relations Review 65(3): 533–559. July. Dey, Matthew, Susan Houseman, and Anne Polivka. 2017. “Manufacturers’ Outsourcing to Temporary Help Services: A Research Update.” Working Paper 493. Bureau of Labor Statistics. January. Economic Policy Institute (EPI). 2018. State of Working America Data Library. Fox, Justin. 2015. “Farewell to the Blue-Collar Elite.” Bloomberg View, April 6. Golden, Lonnie. 2018. Part-time Pay Penalties Persisting. Economic Policy Institute, forthcoming. Langdon, David, and Rebecca Lehrman. 2012. The Benefits of Manufacturing Jobs. ESA Issue Brief no. 01-12, Economics and Statistics Administration, U.S. Department of Commerce, May 1. Levinson, Marc. 2017. Job Creation in the Manufacturing Revival, Congressional Research Service, May. Nicholson, Jessica R., and Regina Powers. 2015. The Pay Premium for Manufacturing Workers as Measured by Federal Statistics. ESA Issue Brief no. 05-15, Economics and Statistics Administration, U.S. Department of Commerce, October 2. Ramaswamy, Sree, James Manyika, Gary Pinkus, Katy George, Jonathan Law, Tony Gambell, and Andrea Serafino. 2017. Making It in America: Revitalizing US Manufacturing. McKinsey Global Institute, November. Ruckelshaus, Catherine, and Sarah Leberstein. 2014. Manufacturing Low Pay: Declining Wages in the Jobs That Built America’s Middle Class. National Employment Law Project, November. Tankersley, Jim. 2013. “Manufacturing Jobs Used to Pay Really Well. Not Anymore.” Wonkblog, Washington Post, January 17.